Merge multiple Outlook data files into one Outlook pst file! When you used your Outlook over couple of years you may find several Outlook data (pst) files on your hard disk. In previous versions Outlook was not able to handle Outlook data files which are bigger than 2 GB. The new Unicode format which was introduced with Outlook 2003 or newer has nearly no size limits. So how can you merge multiple Outlook data files into one Outlook data file? You open all your Outlook data files in your Outlook with the menu 'File' > 'Open' > 'Outlook data file'. Then you select all items in each folder and cut and paste those items to the final folder. If the new folder is not in the destination Outlook data file then you need to create the new folder manually. You see - this is a tedious job which consumes a lot of time. The other option is using 'SynchPst for Outlook'. Let's say you want to have all information finally in file 'C'. Start 'SynchPst for Outlook' and choose on the left side file 'A' and on the right side file 'C'. 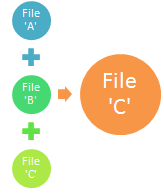 Synchronize one-way from left to right so that all items which are not present in file 'C' are copied from file 'A' to file 'C'. Then choose file 'B' on the left side and keep file 'C' on the right side. Once again synchronize one-way from left to right. Now all your information is merged into the destination Outlook data file 'C'.